As large as tomato hornworms are--from 2 inches up to 4 ½ inches or longer--they can be difficult to spot. These worms, actually caterpillars, eat the interior of the plant during the day to avoid the heat of direct sunlight and move to its more visible areas only at dawn and dusk, according to the Colorado State University Extension. Keep your eye out also for tomato fruitworms, up to 1 ½ inches long, with yellow heads and dark legs, and armyworms, up to 2 inches long, with varied colorings. Prevent damage to young tomato transplants from cutworms, stout grey-to-black caterpillars that may reach 2 inches in length, by pushing into the soil around the plant a sleeve made from a paper cup with the bottom removed. Scout the garden for worms twice a week, particularly as the fruits reach maturity. Use a 10X hand lens to identify worms. Check smaller tomato fruits for signs of worm-feeding damage. Look also for large areas of damage at the top of the plant or the worm’s large droppings, called frass, accumulating on the ground under the affected plants or on lower leaves. Slice open damaged fruit to see if the problem is caused by fruitworms, with damage deep inside the fruit and droppings often present, or armyworms, with feeding confined to the surface. Identify the hornworms visually by looking for a body with seven diagonal white stripes or eight V-shaped markings, feeding on leaves or fruit. Shake the young plants over a shake cloth when there is a significant number of fruits, at least 1 inch in diameter, to detect armyworm egg masses or small larva. Spray Bacillus thuringensis, sold as Caterpillar Killer, Dipel or Thuricide, to kill the smaller larval worms if worms are observed. Apply several times if the plants are growing vigorously. This “soft” insecticide will not kill the natural enemies of tomato pests, notes the University of California Davis website. Remove a larger hornworm by hand. Kill it by snipping in half with a sheers or dropping it into a bucket of water. 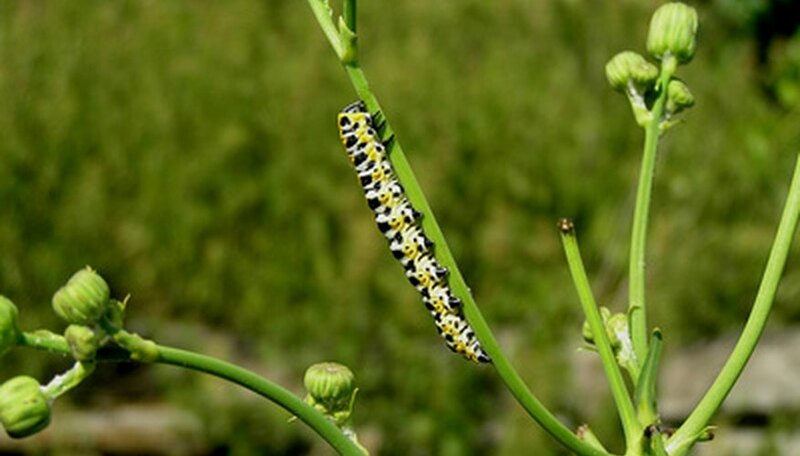 Use insecticides like carbaryl, permethrin or spinosad to control larger hornworms and caterpillars. Apply according to the label instructions. Rototill the soil after harvest to kill any pupae. Place worms bearing small, white rice-shaped objects, which are parasitic wasp cocoons, in a glass jar with no lid. The emerging wasps, natural enemies of the hornworm, will act as parasites on other hornworms. "The individual wearing them is already doomed," notes the University of Illinois Extension. Keep records of worms found so that you can identify periods of peak activity and predict peak activity in the future, the University of Alabama Cooperative Extension advises. When you see stems with leaves missing, remove the stems so you know that future leafless stems indicate new damage and nearby hornworms, advises Garden Grapevine. If you keep chickens, you can catch hornworms at night by examining plants with a flashlight. The worms will be right out in the open. Place the hornworms in a coffee can and feed the chickens the next day, advises Mother Earth News. Alabama Cooperative Extension System: Are Worms Eating Your Tomatoes?